Hyundai launches football app | What Car? Hyundai has launched a free football game for iPhones and iPods to coincide with the Wales vs England football match this weekend. Called the Hyundai Boot Shoot challenge, users have to flick footballs into the boot of a Hyundai iX35. 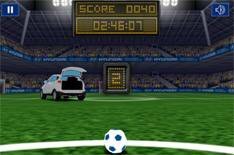 As the game progresses, the car starts to move around the pitch, while you have to get the balls through the windows or hit parts of the bodywork. Football legends Ian Rush, a former Wales striker, and ex-England winger John Barnes helped launch the app with a boot shoot-out in central London. Speaking to What Car?, Ian Rush claimed a decisive victory over his former Liverpool team-mate, although John Barnes wasnt available to substantiate Rushs claims! The app is free to download from the iTunes store this Saturday, when Boot Shoot adverts featuring various football legends will be shown during Skys coverage of the Wales vs England match.